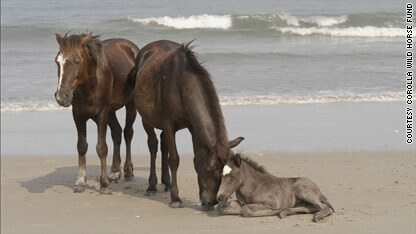 Wild horses and ponies have survived storms on the Outer Banks for 500 years. If you're worried about how the wild ponies on North Carolina's Outer Banks will survive Hurricane Earl, hold your horses. "The horses have been here for about 500 years, so obviously they have a plan for what works best for them" when a big storm blows through, said Denise Wells, director of operations with the Corolla Wild Horse Fund. The 88 colonial Spanish mustangs that roam more than 7,500 acres on a peninsula in Currituck County's Corolla area are descendants of animals left behind by 16th-century Spanish explorers and traders. A separate herd of 124 mustangs lives on National Park Service land on Shackleford Island, at the opposite end of the Outer Banks. The Corolla herd fluctuates as high as 116 animals at times, although it is limited by law to 60, Wells said. A bill in Congress would allow the herd to expand to at least 110, the minimum needed to ensure genetic diversity, she said. The horses' space includes high ground where they can ride out a storm and avoid any storm surge, Wells said. But the Corolla Wild Horse Fund, a small nonprofit dedicated to preserving the Outer Banks horses, maintains an offsite breeding program just in case disaster strikes the herd, she said. The staff and volunteers of the fund will follow whatever evacuation advice the county gives, Wells said. The rugged area's handful of year-round residents will make their own choices as the storm approaches, she added. You take care there, Misty!